For millions of people, Google Calendar is the diary and task management app Trello vs. Asana: The Best Free Project Management Tool Is... Trello vs. Asana: The Best Free Project Management Tool Is... Choosing between Trello and Asana is difficult. Here we compare the free plans and help you decide which project management tool is best for your team. Read More of choice. Given so many people have a Gmail address The 6 Most Popular Email Providers Other Than Gmail and Yahoo The 6 Most Popular Email Providers Other Than Gmail and Yahoo Each email provider listed here offers different benefits, but each of these email services is also highly popular with its users. Read More and a Google Account, it’s an easy and fast solution. And thanks to the app’s recent redesign 5 New Google Calendar Features You Have to Try! 5 New Google Calendar Features You Have to Try! Google Calendar just got more fantastic. Google finally updated its calendar. We'll show you how to get the new design and which new features you must try. Read More , it now looks better than ever. Of course, the app is packed with fancy features and hidden tricks 8 Google Calendar Tricks You Must Learn Before Christmas 8 Google Calendar Tricks You Must Learn Before Christmas Here are eight ways Google Calendar can turn you into an organized elf and prevent you from being a Christmas clown. 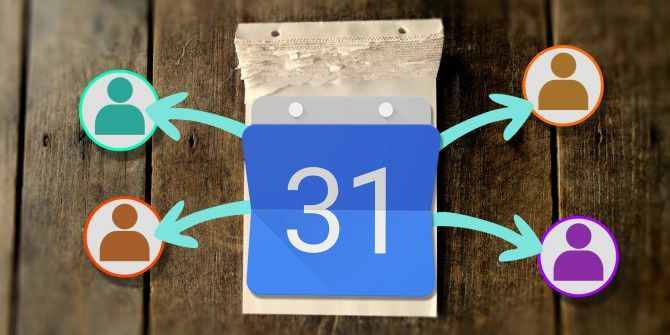 Read More , but today, we’re going back to basics: how to share a Google Calendar with friends, family, or colleagues. You have two sharing possibilities. You can either make the calendar public so everyone can see it, or you can share it with a specific person or people. In the left-hand panel, locate the calendar you want to share. Hover over the calendar’s name and click on the three vertical dots. Scroll down to Access permissions and click on the checkbox next to Make available to public. Click on Get shareable link to find your calendar’s public URL. Scroll down to Share with specific people. Enter the person’s name (if they are in your address book) or email address. Do you make use of Google Calendar’s sharing feature? Do you find it easier to use the share feature now the app has been redesigned? As always, you can leave all your thoughts and opinions in the comments section below. Hubs isn't really into tech stuff so I do all the work. I set up sharing for our calendars, he has a lot of appointments, so I enter them on his calendar along with reminders and they automatically update on mine. Also Google Keep, same thing.